The Kentucky Museum of Art and Craft has been a part of the Louisville arts community since 1989 (formally the Art and Craft Foundation). Since its opening at its current location in 2001, the KMAC has created exhibitions, educational, and academic programming for the community in which it is sited. 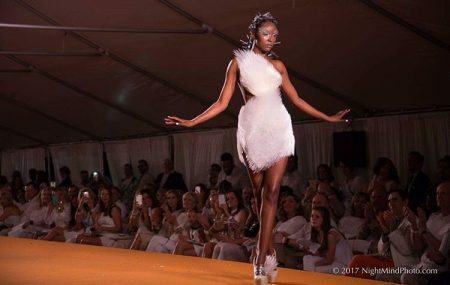 The KMAC Couture Fashion Show has been running for five years: it is the museum’s single largest fundraising event and a successful one it is. From researching video and images from previous years’ events, this show was by far the largest. For this event, the KMAC had several large white tents filling up Main Street, a part of Louisville’s arts district as well as a part of Museum Row, for an entire block. The event was filled with patrons in white, servers with appetizers and champagne, and plenty of open bars. This show was supervised by Joey Yates, the KMAC Associate Curator; and includes 46 designers and artists, nearly half of whom are local elementary and high school students from Collegiate, Christian Academy, Sacred Heart, and DuPont Manual High Schools. This is a remarkable accomplishment, with looks recalling both fairly obvious designers such as Alexander McQueen, but also more functional designers such as Oscar de la Renta. For the sake of brevity: I’m only reviewing three artists, but trust me, there was plenty of talent and beautiful work to be seen throughout the entire evening. Liz Richter “O+” back train of gown. Photo courtesy of author. First up: Liz Richter. Richter is a local artist who is currently a Scholastic Artist in Residence at the KMAC as well as a freelance illustrator. Most recently she might be known for her involvement with the Hikes Point Mural that was done in conjunction with the Center for Neighborhood’s P.A.I.N.T Program. Richter’s piece O+ is a highly functional and beautiful example of feminist embroidery: making her a part of the masses of women artists utilizing traditional ‘feminine handiwork’ to discuss feminist tropes a la Judy Chicago, Krista Suh, Jayna Zweiman, et al. It incorporates the importance of community building amongst women, whilst using Celtic iconography amongst others. Richter’s embroidery is sewn into a simple, sleek black satin design. The garment was structurally form fitting, with a boat neck line and a cut out design/black straps across the back. The dress is constructed of two large black panels that work as a ‘canvas’ for Richter’s embroidery; the front panel serves as the length of a traditional full length gown. The back panel worked as a train and stretched back beyond the model with a continuing illustration. The garment seemed to have a fitted short underneath the two panels for modesty. The garment was paired with black scrappy heels and a beautiful handmade crown. Aryea Kolubah. “Zulu” Series. Photo courtesy of designer. 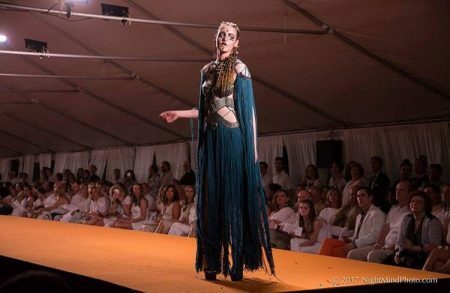 Mauricio Crane, a KMAC Couture veteran (having participated in all five shows), created two different garments for the event: he reportedly hand cut and placed over 6000 straws for his two garments titled “Warrior” and “Dragon”. 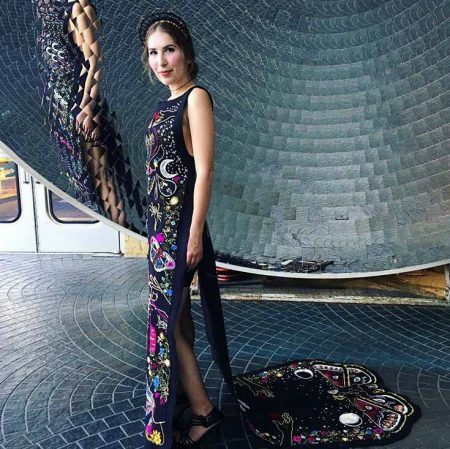 The two are diametrically opposing garments: “Dragon” being a strapless, backless, mini dress that appeared to wrap around the front of the torso and resembled more a school of fish than dragon scales. “Warrior” was an evergreen and gold ensemble with a geometric cut out pattern across the bodice, chest, and shoulders. In addition the garment had long flowing fabric tassels draping down the length of the arms and legs of the model. Both models decorated functional make-up: “Warrior” consisted of symmetrical vaguely animalistic patterns around the eyes, and “Dragon” consisted of metallic eye application and shards of the corresponding plastic also found on her garment around her eyebrow (ouch!). These works seemed more conceptually driven and thus not highly functional outside of costume design. Aryea Kolubah. “Zulu” series, runway shot. Photo courtesy of author. 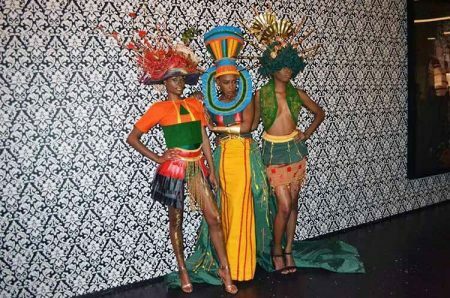 Aryea Kolubah had three ensembles in this show, all a part of her “Zulu” series. The Liberian designer is based out of Kentucky and in a little over a week is actually opening her own boutique: Aryea Kolubah and Co., also located on Main Street. Aryea’s works are all equally bright, commanding, geometric, sculptural and functional. Her usages of oranges, greens, teals, golds, square shapes, and lin\ear lines are reminiscent of Kolubah’s native Liberia. On a personal note, Kolubah’s color combinations reminded me of some of Frank Stella’s geometric paintings from the 60’s and 70’s— sharp, clear, bright, and sophisticated. Perhaps my favorite component of Kolubah’s garments were her headware– or perhaps ‘crowns’ would be a better description. Each one is completely independent of one another yet succinct enough to be shown as a group. This collection was creative, cohesive, and stunning. Her models looked like absolute queens.